This is the time of the season when Yellownecked Caterpillars (Datana ministra) can rapidly defoliate trees. Yellownecks feed in groups, sometimes called "colonies," numbering 10 – 30 individuals throughout their development. They are now reaching maturity meaning these gangs of large caterpillars can devour leaves at a rapid pace. There is one generation per year in Ohio. However, female moths lay eggs from around mid-June to mid-July meaning early instar caterpillars may be found at the same time as late instars giving the impression there is more than one generation. The caterpillars pass through three distinct "color phases" during their development which means colors and markings change as the caterpillars mature. Their "yellownecked" common name comes from a yellowish-orange "neck," or prothorax, located just behind their black head capsule. This feature becomes more apparent during the later instar stages. Yellownecks practice an interesting defense behavior when disturbed: the entire colony will rear their front and tail ends in unison presumably to confuse predators. You can see this by wriggling a finger near a colony; the caterpillars have great entertainment value! 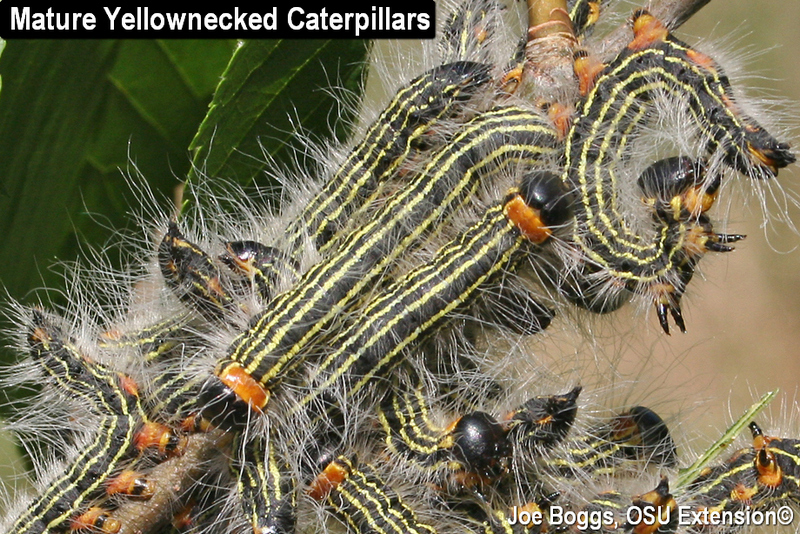 Yellownecked caterpillars are general defoliators and may be found on a wide variety of trees and shrubs including: beech; boxwoods; crabapples and other ornamental fruit trees; elms; hickories; honeylocust; maples; and oaks. Late instar caterpillars devour all of the leaf tissue except for the midveins. Since the caterpillars are gregarious feeders, defoliation tends to occur one branch at a time, unless populations are high and multiple colonies are feeding on many branches. The caterpillars can be suppressed using standard appropriately labeled insecticides. However, an alternative two-step control method that will preserve beneficial insects is to knock the colonies onto the ground where they can be dispatched with the second step. Thus far, no caterpillar populations have become resistant to the caterpillar two-step.